Chip N Pitch is a teaching apparatus made specially to improve the accuracy of your short game. In a round of golf, the average golfer 10-30 handicap only hits 3-5 greens in regulation. 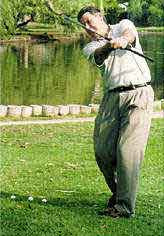 The score for every hole in every round is determined by golfer's ability to use the pitch or chip. Chip N Pitch makes available to all golfers a tool which has been used by teaching professional for years. This training apparatus is an improvement of one of the most widely used teaching techniques for the chip or pitch shot. Teaching professionals have retrofitted wedges for years, making them longer in order to teach their students the proper form for chipping and pitching. Unfortunately, none of these tools are portable nor do they allow the student to use their own club. Chip N Pitch's portability allows the golfer to practice the correct form for the chip and pitch shot at any time or any place. Chip N Pitch attaches the end of the grip and provides immediate feedback during practice. If you have any questions regarding the Chip N Pitch, please give us a call, we would be happy to help you with any questions you may have. Write an online review on the Chip N Pitch, and share your thoughts with others.